Avocado tree infected with laurel wilt. The fungus carried by the beetle causes entire branches to turn brown and die. Photo courtesy UF/IFAS. If you have avocado trees growing in your yard, heads up! The feared redbay ambrosia beetle has surfaced in west Miami-Dade County, in Emerald Lakes. One beetle was caught in a trap on March 2. Scientists are testing the captured bug to see if it carries a fungus that kills avocado trees (and others in the bay family) by causing a fatal wilt. There was a scare last summer, but that proved to be a false alarm. This time it looks like the real threat has arrived. — Do not transport host trees (redbay, swamp bay, avocado, sassafras, pondspice, pondberry and others in the Lauraceae family) unless purchased from a registered nursery. 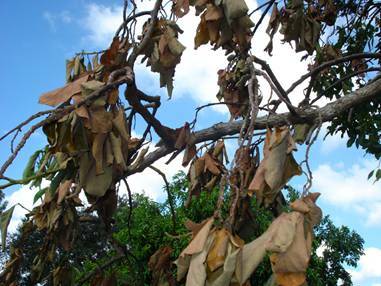 — If your Lauraceae-family tree dies, use one of UF/IFAS’s recommended methods of disposal. People who suspect their trees might be infected with laurel wilt or think they have found a redbay ambrosia beetle are urged to contact the DPI helpline at 1-888-397-1517. Know your foe: redbay ambrosia beetle. Actual size is about half a grain of rice. Courtesy UF/IFAS. Last summer, there was a premature announcement of the presence of a tiny beetle that has the power to spread fungus that can severely damage avocado trees. That turned out to be an unfortunate mistake, triggering some growers to cut down and burn trees and apply pesticide. 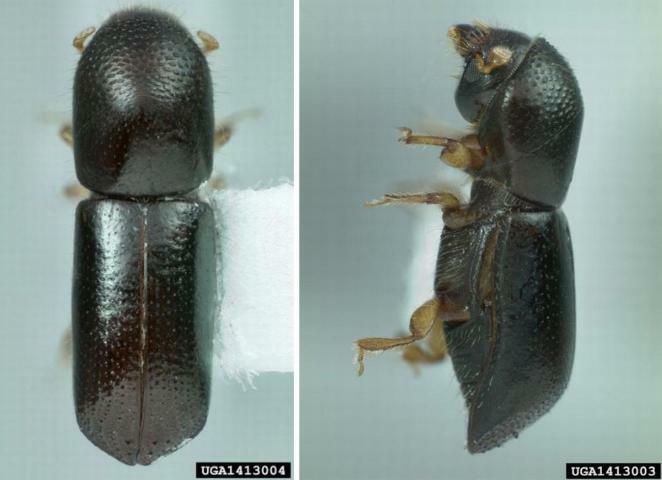 This month, there’s no mistaking it: One redbay ambrosia beetle was found in a trap in west-central Miami-Dade County on March 2. But scientists say a single beetle shouldn’t scare Miami-Dade growers — whose trees cover nearly 7,000 acres of South Florida — just yet. “It’s not cause for panic, thank God,” said Jonathan Crane, a tropical-fruit plant specialist with the University of Florida’s Institute of Food and Agriculture Sciences in Homestead.